Electrical & Computer Engineering students work in the Washington Nanofabrication Facility cleanroom. 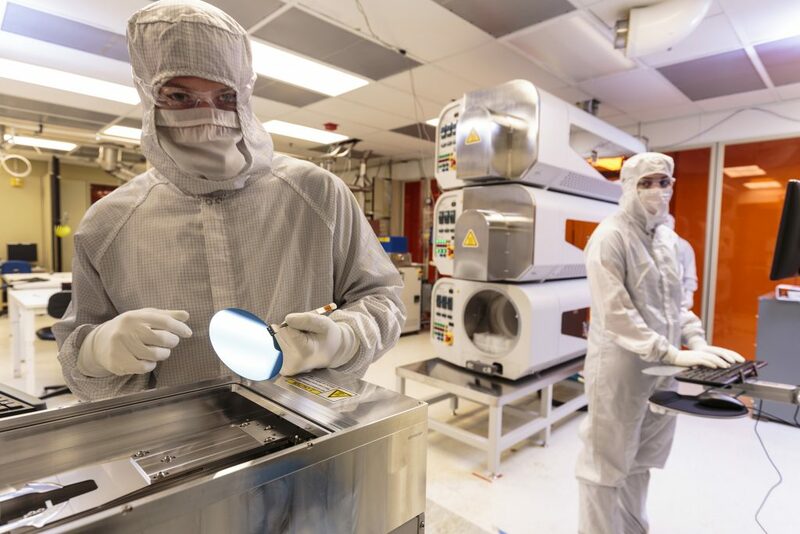 The largest public access fabrication center in the Pacific Northwest, the Washington Nanofabrication Facility (WNF) is poised to drive entrepreneurship efforts not only on campus but in the entire region, thanks to several recent developments including a new National Science Foundation (NSF) Center, associated $4.5 million grant and upcoming $37 million renovation. Located on the UW campus and directed by UW ECE Professor Karl Böhringer, the WNF provides access to micro and nanofabrication processing equipment, which is used to make computer chips and tiny sensors for various electronic devices. The cleanrooms, which minimize environmental contaminants, are essential as the materials that researchers develop are often smaller than a speck of dust. The same equipment used by UW faculty and students is available to researchers from various businesses and start-ups. More than 140 researchers utilize the lab every month. For information on using this premiere facility, visit the WNF website.